Madhubala's 86th birth anniversary: Prithviraj Kapoor is imposing as Emperor Akbar and Dilip Kumar a.k.a Prince Salim is appropriately understated but it is Madhubala’s Anarkali that defines and carries K. Asif’s Mughal-E-Azam on her delicate shoulders. There are two kinds of movie buffs who watch Mughal-E-Azam, arguably the greatest Bollywood film ever made. One, of course, watches it for the pure love and artistry of Mughal-E-Azam and the other watch it just for Madhubala. So intrinsic is the imagery of Madhubala in Mughal-E-Azam that we often forget that films on the same subject (based on a 1922 play called Anarkali by Imtiaz Ali Taj) had been made thrice before. Silent era star Sulochana played Anarkali twice (in 1928 and 1935) while in a 1953 version, Bina Rai was the bewitching courtesan in whose blind love Prince Salim, the future king of Hindustan, has raised the flag of revolt. On the opposite side of the spectrum is his father, Emperor Akbar. Records suggest all versions of Anarkali were runaway hits. In fact, Bina Rai’s Anarkali with Pradeep Kumar was the highest grossing Hindi film of that year. Yet, it is the fourth version, Mughal-E-Azam from 1960 with an unrepeatable star cast of Madhubala, Prithviraj Kapoor, Dilip Kumar, Durga Khote and Ajit that has become a cultural touchstone. There’s no point in repeating the near-mythic stories related to the making of the film. Hindi cinema viewers have long known that Mughal-E-Azam was in the making for over 12 years and went through several changes of hands. 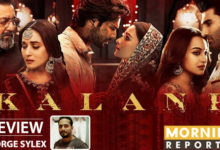 The film was believed to be first conceived in the mid-1940s by K. Asif, that era’s Sanjay Leela Bhansali multiplied by ten. The original cast was Sapru, Chandramohan and Nargis but when its Jinnah-leaning producer left for Pakistan post-Partition the film got stuck until rescued by Shapoorji Pallonji, a Parsi millionaire from Bombay. By this time, it was the 1950s. Times had changed. The stars originally signed up were no longer in currency. The most erotically-charged scene in the film Mughal-e-Azam – the feather sequence – was shot when Madhubala and Dilip Kumar were separated and didn’t even see each other in the eye. Incidentally, at the heart of Mughal-E-Azam is a powerful father figure. The film opens with a map of India, with the mighty Hindustan of Himalaya and Ganga as the narrator. Though K. Asif pitches it as a historical epic the fact is that there’s no historical basis for the enchanting figure of Anarkali. There’s a grave in Lahore claimed to be Anarkali’s. The film, then, like the play on which it is based, is pure fiction. The characters speak Urdu. Lyricist and writer Javed Akhtar points out in Nasreen Munni Kabir’s Talking Films: Conversations with Javed Akhtar, “In Akbar’s time, Urdu wasn’t developed at all and the lingua franca was Persian. Akbar did not know Persian. He was born in Sind and brought up in northern India. So he most probably spoke Haryanvi and Bhojpuri.” To think of Mughal-E-Azam in Bhojpuri or any language other than Urdu would make it a laugh riot of the unintentional kind. Surely, no film in Hindi cinema history would lose so much of its value by being made in another language. Little wonder then that four best writers of the Urdu language were employed to pound out the memorable lines. All actors of the film spoke chaste Urdu, including Prithviraj Kapoor, Dilip Kumar and Madhubala. Madhubala’s powerful and confrontational scenes with Kapoor and romantic and tender moments with Kumar tie Mughal-E-Azam together. From there on, Mughal-E-Azam is all about this common courtesan who challenges the imposing courts of the Mughal sultanate. She openly rebels against Akbar in ‘Jab Pyaar Kiya Toh’, one of the most popular tracks of the film. Madhubala dominates the soundtrack like no other film heroine ever did. If one heart of Mughal-E-Azam is in its dramatic scenes, the other heart lies in its song and music. In a film that’s all about royalty and courtly affectations, it is the nautch girl Anarkali who suggests royalty and class with her uncompromising values and power of love. The film could well have been titled Anarkali, instead of Mughal-E-Azam and no one would object. Madhubala’s powerful and confrontational scenes with Kapoor (young viewers may find them melodramatic but in the film’s defence, let’s just say that Indian cinema, those days, was still under the influence of Parsi theatre and ornate style was de rigueur) and romantic and tender moments with Kumar tie Mughal-E-Azam together. In it, you find the most perfect expression of India’s plurality. Notice the links in the chain – it’s conceived by Muslim thinkers and writers, enacted by both Hindu and Muslim stalwarts and music credits are shared by Naushad, Lata Mangeshkar and Shamshad Begum and it’s made on a pocket change grant, courtesy a Parsi millionaire. In 1960, besides Mughal-E-Azam, Madhubala dominated the box-office charts with Barsaat Ki Raat, the second highest grossing film of the year. Nine years later, just 36, she died tragically young. We will never know what she would have been like in dotage. Guess, she would have gone the Waheeda Rehman way – graceful and elegant. Maybe, she would have taken the Suchitra Sen route, going AWOL from the public eye. We do know that Hindi cinema has never produced a more bewitching beauty than her. We have Shammi Kapoor on record that she was the most beautiful woman he had ever seen. He even proposed her marriage. Instead, Madhubala married Kishore Kumar. It was a marriage made in hell. She died of a heart ailment, leaving behind only memories, magical stardust and mystery – and many bruised and broken hearts, including those belonging to Shammi Kapoor, Dilip Kumar and Premnath to name just a few.